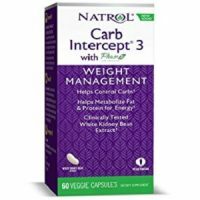 Natrol Carb Intercept 3 Review - A Wise Purchase? Today we review Natrol Carb Intercept 3. This special formula helps you to lose that unwanted weight in three easy steps. By helping you control your carbohydrate intake, burning calories, and metabolizing fat, this formula will let you see the results you want. What’s in Natrol Carb Intercept 3? Chromium – Some studies have shown this ingredient has positive effects on weight loss. 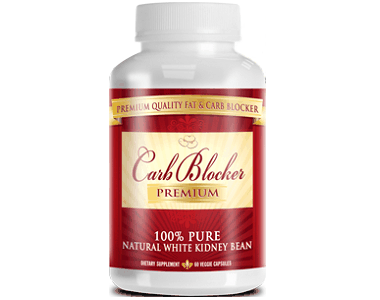 White Kidney Bean Extract – By blocking the digestion of carbs, this extract helps prevent new fat storage. Green Tea Extract – This extract helps boost your metabolism and burn off unwanted fat. Epigallocatechin Gallate – This specific substance helps boost your metabolism. Caffeine – This ingredients helps boost metabolism and increase the burning of fat stored in your body. 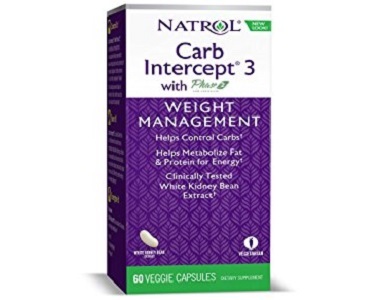 How Do You Use Natrol Carb Intercept 3? The manufacturer lists a single dose at 2 capsules. Two doses should be taken daily, both with a meal. By taking two full doses daily, you are getting much more than the studied amount of white kidney bean extract. While no negative side effects have been found by taking too much of this extract, there have also been no positive attribute to taking more. Each bottle contains 60 capsules. By taking the recommended daily dose, tis means each bottle only lasts for half of a month. Unfortunately, this supplement is not available for purchase directly through the manufacturer. We were able to find prices on third party sites that sell this product for prices ranging from $12.76 to $18.07. For only a half month’s worth of supplement, this prices is higher than other carb blocker supplements we have seen on the market. Luckily, the manufacturer does offer coupons on its website for $2 off of any of their vitamins or supplements. Because this manufacturer does not sell its products directly, we were unable to find any information about a money-back guarantee or a refund policy from them. Should you find yourself unsatisfied with this supplement, you will be subject to whatever refund policy your seller has, which very well could also be non-existent. This is concerning, because there is no way to be able to try this supplement to know if it will work, without the worry of wasting your hard earned money. There are a few things we liked about Natrol Carb Intercept 3. This supplement does have some additional ingredients that help with burning fat and boosting your metabolism, which can help you lose weight faster. Also, the manufacturer offers a coupon for $2 off of their product. Unfortunately, there are many things that raised our concerns about this product. First off, there is an unnecessarily high amount of white kidney bean extract in this supplement. Also, with the dose being so high, the price of this supplement is higher than other weight loss supplements we have researched. Lastly, because the supplement is only available through third party sellers, the manufacturer offers no guarantee or refund policy for its products. If you happen to not like the supplement, you may not be able to request a refund from your third party seller. For these reasons, we cannot recommend this supplement.